Narrator: Are you interested in a property outside of our network? Do you need a second opinion? No problem! Let Jason’s experts evaluate the deal. For more information, go to JasonHartman.com now. Jason Hartman: It’s my pleasure to welcome N.E. MacDougald to the show. He is a formal Survival editor force Soldier of Fortune magazine, and the managing editor of Survive magazine. He is also the author of Soldier of Fortune Guide to Surviving the Apocalypse: The Ultimate Guide to Protecting your Family Against Societal Collapse. And he goes by Mac, and is coming to us from California today. Mac, how are you? N. E. MacDougald: I’m well, thank you very much Jason. Jason Hartman: Well good. Pleasure to have you on the show today. There’s a lot going on – a lot of concerns people have, and I think they are very valid concerns, especially in light of what is going on in Europe, in Cyprus specifically. We’ve had a bank holiday, we’ve had an outright government seizure of assets. Scary times, huh? N. E. MacDougald: They are unparalleled. I’ve not seen it like this in my lifetime. Jason Hartman: I don’t think anybody has, unless they have lived in Argentina or Hungary or Zimbabwe, or some of the other countries that have really faced this, but it’s getting to be where we see highly developed westernized countries on the verge of collapse. Look at what’s next: Spain, Italy, Portugal, Ireland has problem, the US has a terrible balance sheet obviously, but we are in sort of that enviable position at least for the moment of having a reserve currency in the largest military on the planet, which means we can throw our weight around a bit. But times are scary. What do you think could happen in the US? You talk a lot about the Federal Reserve and the treasury and how they work together to basically impoverish the population and debase the currency. Give us a little background on that, your thoughts, and then what you think people should prepare for here. N. E. MacDougald: Well that’s a great question. I devoted a chapter to it in my book. And when you go up to 50,000 feet and looked down upon all of the financial, economic, and fiscal choices that we’ve made, the monetary policy in this country is an essence turned upside down. The worst news is that almost every country is now inflating it currency. There is sort of a race to the bottom. Jason Hartman: Yeah, that’s the aptly how I stay it. It’s a race to the bottom. N. E. MacDougald: Years ago the United States treasury backed the US dollar with gold and with silver. And both of those have now been removed, so we have a “floating currency”. And it floats in relation to the euro, the Japanese, several other currencies. And they all float against each other. And that so well and good until the bottom falls out and none of these currencies, including Switzerland is backed by gold and silver anymore. So they are all basically printed and bad faith, and the citizens take them in good faith. Jason Hartman: Yeah, they are all Fiat money. It’s like a bunch of houses in a bad neighborhood. Who has got the best house in that bad neighborhood? I had Jim Rogers on the show recently, and used that analogy with him and he said well, the US is the worst house. But I’ve got to be honest Mac, I disagree with that. Because even though the balance sheet looks bad, we still have abundant natural resources we would actually use them. Who knows if we will ever get the chance to do that with the powers that be or use them in any real full scale way, but it’s kind of a question of how long can we just keep playing the same game with currencies and paying for our imports and constantly evaluating dollars? The other countries make rumblings about it but I don’t know, maybe that can go on for a long time, I’m not sure. N. E. MacDougald: Well, I don’t think anyone knows that answer. And my hat’s off to you for having Jim Rogers on the show. I think he really has his head screwed on. In terms of us being the biggest house on the block, yes you’re right – but I have to do three, because countries like Norway, Switzerland, even tiny Denmark are going to recover quicker because their common needs are smaller, their countries are smaller, and they can get their feet under them quicker and the event of a depression or an inflationary spiral and stop it. Whereas we are big, we have been extremely wasteful government, the amount of waste and abuse and fraud in our government is almost incalculable. Jason Hartman: Now Mac, really? That’s so shocking. I’m being sarcastic of course. That’s like understatement of the millennium that yes, fair enough. We sure do. It’s just ridiculous. N. E. MacDougald: My concern is that we are going to have to wait for the government to fall under its own weight until it has squandered all of our resources. Right now we’re barely able to service our debt, and let me define that for your listeners. To service the debt is to pay the interest on it. That has nothing to do with the principal that been borrowed, the 16 trillion, with a T, dollars. So we’re barely able right now, to pay the interest each month. And what going to happen at some point, you can’t have virtual zero interest forever. And as other countries raised their rates, we’re going to have to raise our rates to remain competitive. And what Says it will no longer be able to service debt, and we will then begin to default on our loans and that’s when the trouble starts. Jason Hartman: So, about $.40 of every dollar is going just to pay interest. Is that about the right number? N. E. MacDougald: Yes it is. Jason Hartman: So is totally balanced equation. The question is how long can we get everyone else to participate in this game? Raising rate means that we have to pay our lenders, China and Japan mostly, a higher rate because we are debasing our currency through inflation and is becoming more and more risky as we are less and less solvent. But with those other sort of unique factors, I wonder if all of the rational thought that you have, and other intelligent people have, do they apply? The question is how long can we defy gravity? I’m just sort of wondering if it can’t go on for a long, long time. It’s illogical. N. E. MacDougald: Yeah I don’t believe that I can go on to much longer. It’s one thing to know at least in theory that our monetary underpinnings in the shambles, what to do about it is the real question and if I may, I’d like to give the listeners a few ideas on what they can view rather than putting their money under the mattress. Jason Hartman: Sure. Let’s do it. Jason Hartman: Food, water, ammunition… Yeah. N. E. MacDougald: Food, water, ammunition right at the top. And all of these things have an intrinsic force, and regardless of whether the dollar is worth two pennies or less, doesn’t really affect the worth of the things that you have. And you mentioned food, the only thing that I am sure of is that during an inflationary or deflationary collapse, my family is going to need to eat. So we have quite a bit of food to the extent that one can go out and buy food, you are saving in a way that’s better than putting it in a bank. Jason Hartman: I would agree with you because things matter. Currency is questionable, but things matter. Resources. N. E. MacDougald: Exactly. So that would be my advice to the listeners that know something bad is going on. Jason Hartman: Well, let’s talk a little bit more about preparedness specifically. And what people can do to prepare. So those are some of the things, you’ve mentioned those, but let’s just kind of drill down on that a little bit more. What should the sort of standard preparedness be for maybe each person in a family? So if you have one person in your household, this is what you need. If you have four, multiply times four. N. E. MacDougald: Well, I don’t think anyone can go wrong by buying…the new precious metal is ammunition. No secret there. Jason Hartman: That’s a great way to put it. And the price is rising dramatically on that precious metal. N. E. MacDougald: Absolutely. So I don’t think anyone can go wrong in buying something like that. And whether or not you shoot or have that particular caliber weapon, it really doesn’t matter because if push comes to shove and you need a tank of gasoline or a loaf of bread or a jug of milk, you can take some of that ammo and trade it to someone who needs it and get what you need. So having ammunition or having certain tools, these are worth their weight in gold. They’re wonderful. Having silver coins of any denomination, whether they’re silver dollars or dimes, doesn’t matter. People are familiar with that, even the younger generations have seen it and they know that they’re made out of coin silver and that they’re worth more than the trace value. So those are the kinds of things I would urge people to buy. Courts of oil, the small bottles of whiskey that they serve on airplanes, commercial aircrafts, they’re wonderful. Cigarettes and Tabaco-people who are smokers are going to want that, I could go on and on. Jason Hartman: Yeah, well cigarettes and vodka probably worthwhile, yeah. But is there any safe way to store gasoline? Or is that just impossible to do it safely? N. E. MacDougald: If you have a cistern that leaks or that’s no longer used to store water, that’s really a great way to store gasoline or diesel fuel. You stabilize it with diesel, I prefer something called PRI-D. That will preserve diesel fuel for years. There’s a thing called Shiso, there’s another preservative. Just going to an automobile store and saying what do I need to preserve gasoline? The person behind the counter should know. Stabile, was the one I was looking for. Jason Hartman: Stabile. Okay, but that’s a preservative. It decays? You can’t store it for a long time? N. E. MacDougald: Not without a preservative in it. No. It goes bad. Within 90 days, you’re gambling. Jason Hartman: Really? Okay. But what about the safety aspect of it? N. E. MacDougald: Well gasoline is really a bomb. It’s not the gasoline that explodes. It’s the vapors of the gasoline. So that’s why I was suggesting a cistern. Because it’s below ground, its concrete shelter, and if god forbid there is an explosion, well it’s out in the back 40 and it’s below grade and it’s not going to hurt anyone. But storing it in your garage is not an option, storing it in your basement or your home is not really an option, you need a tank or something buried somewhere. Jason Hartman: Right. So to do anything with gasoline, you’ve got to have a piece of land, otherwise you’re just not going to have the ability to store it. Right? It just can’t be done safely. N. E. MacDougald: It cannot be done safely. No. Jason Hartman: Alright. What else? N. E. MacDougald: You want in terms of vehicles, as long as we’re talking diesel fuel and gasoline, the vehicle that you own is probably the vehicle that you will have in the event something goes wrong and you need to get somewhere in a hurry. So investing money in that vehicle is a good investment. You want something reliable. Don’t take a chance on a faulty battery, don’t put off that maintenance, don’t put off those oil changes. In no case should you be riding around on bald tires. You need that vehicle to be the best that it can be. Because you don’t know what’s going to happen and we don’t know when it’s going to happen. Jason Hartman: Any advice on type of vehicle? N. E. MacDougald: I like 4 wheel drive. I like big vehicles, like a Tahoe or a Suburban or a Ford Excursion, something like that. I drive a big diesel truck myself. And the thing is, if you put a big reinforced bumper on the front, if you need to push your car out of the way because it’s blocking the road, you can do so. So basically bigger is better and 4 wheel drive certainly beats two wheel drive. And 4 wheel drive will do you no good if you have bald tires. Jason Hartman: Okay, anything else on preparedness, and then I’d like to just circle back to some other issues. but more on preparedness. N. E. MacDougald: Well, we were talking about what kinds of vehicles a moment ago, and what you have in the vehicle is what you will probably have in the event that something bad happens. So, if you throw a couple of sleeping bags in there, if you have some food that doesn’t need preparation, those food bars, although most of them taste like construction adhesive, they’re good calories and you don’t need a stove. You can have some water in there. Of course if you have a cold winter, that water will be useless. You’re going to have to have a stove with it because you’re going to have ice cubes. You’ll need a first aid kit, you’ll need jumper cables, you’ll need clothing. You have a minor disaster like changing a flat tire in the mud, and you’re in a suit, you’re going to need a change of clothes in there or a pair of coveralls or something. So just sit down and think, what would your kids need? What would your wife need? What would your husband need? And my truck, if worse comes to worse, I can live out of that darn thing. Jason Hartman: And let’s talk a little bit about some of the stuff in Soldier of Fortune. The magazine has for years profiled a variety of tools and things. What about weapons? N. E. MacDougald: Well, it’s a cold topic because if one doesn’t know how to shoot, the weapon is academic. Let me give you an analog here. What you’re asking me is like asking me about pianos. And that assumes that one can play the piano. And if you can’t, then it doesn’t matter whether you have a Sängler or a Bösendorfer, it really is academic because you can’t play the piano. So the training comes first. I happen to be an alumnus of Vietnam, 1966, so I’ve shot before. And you can put virtually any rifle or shotgun or pistol in my hands, and within a few seconds I’ll know how to fire it, where the safety is, given a couple of hours maybe I’ll know how to take it apart and more importantly how to put it back together. So guns aren’t the things, it’s the training, it’s the skills, it’s the knowledge. Those are the things that count, not the weapons per say. It’s really one’s determination and one’s faith that gets one through difficult times. It’s not so much having a gun in your desk drawer, or an AR-15 in your closet or a shotgun in your trunk. It’s really the knowledge that you have, your attitude to a lesser degree your physical fitness, and those are the things that get you through. Jason Hartman: Well, okay so do you have a recommendation as to the type of weapon? Say it’s someone’s first one, obviously they should go to the shooting range, they should get training, but any recommendations there? N. E. MacDougald: Well, for a beginner I’d probably recommend a revolver because it’s simpler. Jason Hartman: Super simple. Yeah. N. E. MacDougald: And if you’re an intermediate shooter or an expert, certainly a semi-automatic pistol is certainly a wonderful thing to have because it can be reloaded more quickly than any revolver. The same goes for long guns. If you’re new to it, if you’re a beginner then you probably want a bolt action rifle. Get a caliber like the 2-23 Remington and learn how to shoot it, spend a lot of time shooting it. Whatever you spend on the gun, spend as much on the ammo. Because that’s where the real training comes in, is shooting the darn thing, not buying a bunch of ammo and a gun and putting it in your closet. You’re not going to be learning how to use that weapon when the wolf is at the door. Jason Hartman: Yeah, good points. Well what do you see as a possible scenario unfolding in the US? In light of Cyprus, as things deteriorate here, what do you see next? What’s the probable outcome of this? We talked about how they might be able to just kick the can down the road forever, but if you look at just the numbers and the logic of it, it doesn’t look like they will but who knows? What do you see as a possible outcome? N. E. MacDougald: Let’s use Cyprus because it’s on everyone’s mind these days. We’ll use Cyprus as an example. Cyprus is unable to pay its debts. And the European central bank went in with the IMS, the International Monetary Fund, and said well, we’re going to do something unheard of. We’re going to take money out of your depositor’s accounts and punish them for your folly. This makes no sense at all. This is like faulting the manufacturer because you run your car into the fence. So, what happened there? What happened at Cyprus? They declare a “bank holiday”, they shut the banks down while the IMS and the European central bank arm wrestle with the owners of these two banks. And eventually they reached some figure, whatever the figure is that they’re taking out of people’s deposit accounts. It’s too much. It’s not the people’s fault that the bankers made poor choices. Well, this can happen in this country, even with the big money center banks, the five big banks. They have made poor choices, there are things called derivatives and they are going to come home to roost. At some point we are going to have to pay people. And when I say we, I mean the big banks. And they won’t be able to. So the government, meaning the fed or the treasury or the banking commission will step in and say, alright we’re going to take ten percent of everyone’s bank account and pay off these debts with it. And that’s where the problems start, because it is unfair to punish depositors for the stupidity of the bank owners. So as these banks remain closed, and the people can’t feed their families, we may not be as civilized as the Cyprians were. We have a wild west mentality in this country, and we have more guns per square foot than any other country. Jason Hartman: That gives me a lot of hope that things can’t fall too far in this country. Or at least it gives me a lot of hope that we can’t be too taken advantage of, if you will. N. E. MacDougald: Well, I hope you’re right Jason. Jason Hartman: But go on with what you were saying. Over 3 million guns in private hands. N. E. MacDougald: Yes. So there’s a wonderful thing, that we’re only 7 meals away from anarchy. And I think the meaning is clear. As your children look at you and say, “I’m hungry daddy”, you’re going to go and get food, or mommy, they are going to go out and they’re going to get food the best way that they can. And if that involves doing something illegal, then so be it because they’re not going to let the family starve. And if you watched any of the old riots in the US, the Newark Riots, the Detroit Riots, just go on and put that into a search engine and see just how quickly those riots started and the incredible inhumanity that took place there. People dying, stores being burned, billions of dollars of damage caused by a shortage of food or a shortage of restraint on the part of the participants. Jason Hartman: Yeah, it’s scary stuff. So we shall see what happens and that’s what we’ll keep profiling on the show. Folks, I think just basic preparedness makes so much sense. I think you can really do this Mac, for about $200 per person in your household. That’s a bug out bag for each person that’s a 72 hour supply and some other things, $200 a person. 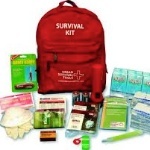 You can be more prepared than probably the vast, vast majority of the American population. Would you agree with that by the way? N. E. MacDougald: I would have to agree with that, yes. Jason Hartman: It’s not hard, is it? You can go all out and go wild on this stuff and spend tens of thousands of dollars. we had Joel Skousen on the show – you’re probably familiar with him. He’s a survival architect. And you can design a bunker if you want and do all kinds of crazy stuff. But just $200 a person is going to put you dramatically… Could you imagine in New Orleans during Katrina, if people had $200 per person worth of stuff, they could have ridden that out just fine. Jason Hartman: It’s a big difference. Well, give out your website and tell people where they can get the book too. N. E. MacDougald: The book is available at SkyhorsePublishing.com. That’s also available at major bookstores everywhere. I personally do not have a website, but if you just put in Soldier of Fortune Guide to Surviving the Apocalypse, you’ll get a very good idea of what the book covers and does not cover in a few minutes. Jason Hartman: Great. Well Mac, thanks so much for joining us today. I appreciate it. And the book is also on Amazon.com. N. E. MacDougald: Of course. Jason Hartman: We should mention that too. N. E. MacDougald: Barnes & Noble, all the major book sellers. Jason Hartman: Good. Good stuff. Hey, Mac. Thanks for joining us today. N. E. MacDougald: No problem. A pleasure.